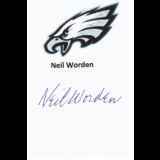 Neil James Worden is a former American football fullback who played in the National Football League. He was selected by the Philadelphia Eagles in the 1954 NFL Draft and played in the 1954 and 1957 seasons. He played college football at the University of Notre Dame. New Response (Success): 1990 Collegiate Coll. Notre Dame, #154. Trying aga..